Ambisonics B-format is the industry standard for mixing audio in a full spherical 360-degree soundfield. Unlike standard mono, stereo or surround tracks, which route to individual speakers, B-format has four channels that together represent the entire spherical soundfield. When you want to include mono, stereo or surround tracks in an Ambisonics mix, you first need to convert them to B-format. The B360 Ambisonics Encoder enables you to do this via two basic workflows: You can insert B360 on your entire stereo or surround mix, and it will convert the original file into Ambisonics B-format.Or you can insert B360 on each individual channel in your session, for precise positioning of that channel in your Ambisonics mix. 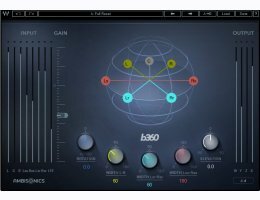 In either case, B360 lets you control the mix’s width, elevation, and rotation, as well as position the different elements in your mix inside the three-dimensional soundfield. With an intuitive GUI and streamlined controls, B360 is designed to make your Ambisonics audio workflow faster, easier and more user-friendly than ever. You may download a trial version of B360 Ambisonics Encoder from the Waves website, HERE !